This artist rendering depicts UA’s Performing Arts Academic Center, which will include four performance theaters. 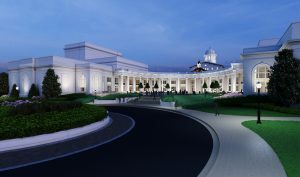 TUSCALOOSA, Ala. — The University of Alabama has launched a campaign to raise $15 million in private donations to support the construction of a new Performing Arts Academic Center on the former Bryce Hospital property. Former UA Athletic Director Bill Battle and his wife, Mary, are co-chairing the campaign cabinet that is leading the fundraising effort, which has raised more than $6.3 million in booked and verbal gift commitments to date. The campaign was formally announced at a news conference today. 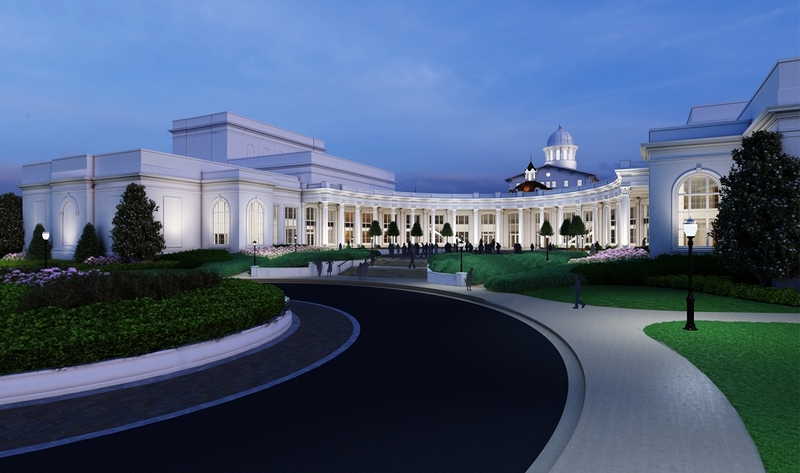 The new Performing Arts Academic Center, which will connect to the restored Bryce Main, will feature four performance venues for theater and dance. The main hospital building is being renovated to include a University welcome center, a reception venue, faculty offices and rehearsal space, as well as museums dedicated to both University history and the history of mental health in Alabama. “We’re excited for everyone to see what has been done and also what hasn’t been done,” Bill Battle said. “It would have been easier and more economical to tear it all down and start over, but the preservation of this facility is truly amazing. “We chose to donate to this project for three reasons,” said Robert Abernathy, a 1976 UA graduate. “The center will be the new face of campus with the prospective student Welcome Center; the center will visibly demonstrate that the University is serious about the arts; and the center honors the history of the Bryce property and buildings. Construction is estimated to begin in summer 2019. Upon completion, the Performing Arts Academic Center will include four performance theaters—a black box theater with flexible seating for 175-275, a 350-seat proscenium style theater, a 450-seat venue specifically designed for dance, and a 100-seat studio dance theater designed for maximum flexibility to use for rehearsals, recitals, and smaller performances. These performance venues will replace the outdated Marian Gallaway Theatre, Allen Bales Theatre and Morgan Auditorium. “The need for a new Performing Arts Academic Center on our campus has never been greater nor more deserved, and the impact will be tremendous,” said Dr. Robert Olin, dean of the College of Arts and Sciences. “A center of this caliber will elevate the profile of the entire University and further drive economic development in the state. For more information on the building project or ways to give to the campaign, visit www.ua.edu/performingarts.